The NARBHA Institute announced today that The Guidance Center is now a subsidiary of the Institute, a not-for-profit public charity whose goal is to advance wellbeing and integrated health in northern Arizona. Over the years, Lina Wallen has worked tirelessly to make Coconino County a better place. She was recognized and honored with a Caring for Children Award at the 2018 Annual Child Abuse Prevention Conference on March 29, 2018 for her service with CASA, Foster Care Review Board, Coconino Coalition for Children & Youth, and The NARBHA Institute. The NARBHA Institute created the Cardon Legacy Grants in recognition of former Northern Arizona Regional Behavioral Health Authority Board Chairman and current and founding NARBHA Institute Board member Marriner Cardon. The Coconino County Sheriff’s Office and The NARBHA Institute sponsored five Sheriff’s Office employees in attending classes to become certified Mental Health First Aid instructors. It is well recognized that our society is facing a mental health crisis. “We do our best to get people with mental health issues who come in contact with us the resources they need. However, the mental health crisis needs broad community involvement in developing solutions,” stated Sheriff Driscoll. On November 17, 2017, The NARBHA Institute marked its 50th anniversary of service in northern Arizona. Our journey began in 1967 as the Northern Arizona Comprehensive Guidance Center. Built as a coalition of behavioral health providers serving poor and vulnerable populations, we progressed to become the state-contracted regional behavioral authority serving for three decades. Northern Arizona University and The NARBHA Institute have partnered to create an endowed professorship that focuses on the intersection of criminal justice and behavioral health. 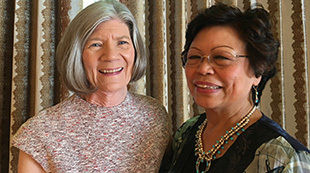 During the celebration of The NARBHA Institute’s 50th anniversary of service to the community, NAU President Rita Cheng spoke about the partnership between the two organizations.